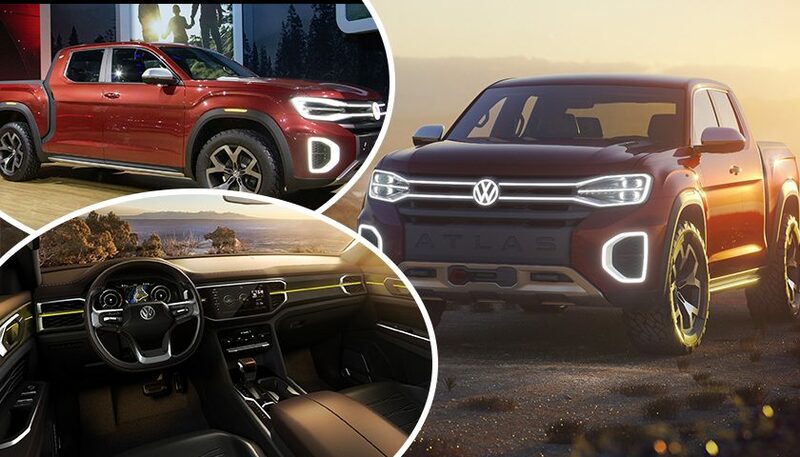 The future vehicles segment have the latest Volkswagen Atlas Tanoak Concept that is a modern pickup truck being designed for the people having a taste of muscular American pickup trucks. American pickup trucks are famous for their strong identity and performance on off-road and in-city and their amazing durability. This is the reason that many car brands are always having tough, rugged and high power pickup trucks introducing for people wanting to have a sturdy and muscular vehicle. Volkswagen is one such brand which never disappoints the car enthusiasts and thus having future vehicles which are liked and loved by the enthusiasts is what Volkswagen is going to introduce. The designers and engineers build this new and modern pickup truck to offer something which was never offered by the brand in the future vehicles pick-up truck segment. Having the modern yet very appealing design in future vehicles category makes it have more fan base, and offering performance that is enjoyable for both on and off-road, increases the demand of this vehicle. 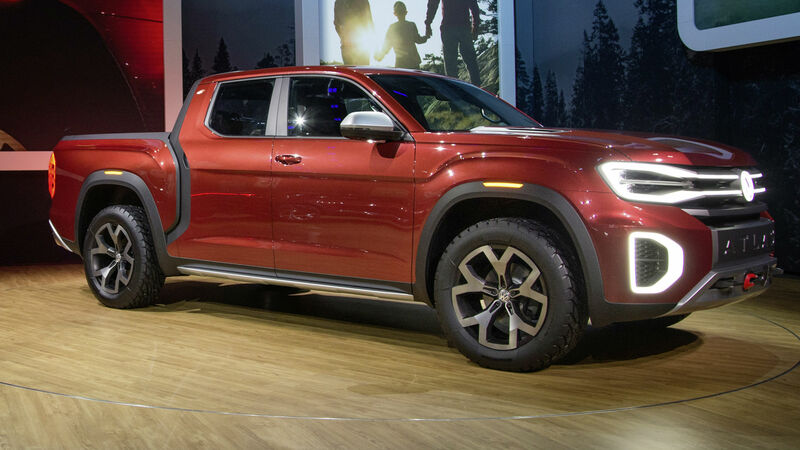 The Atlas Tanoak Concept by VW made a surprise debut at the 2018 New York Auto Show for the first time, the prototype received massive appreciation from the audience and is expected to be in a production line soon. It is a midsize pick-up truck in Atlas line-up. Here is a detailed review and a closer insight into this latest future vehicles’ pick-up truck design philosophy, engine and technologies making it a comeback in American pick-up trucks market. The pick-up trucks are appreciated for the greater functionality and design, thus these fundamentals make the Tanoak Concept as the most stylish and functional pick-up truck in future vehicles segment. It is big pickup truck despite being midsize, 115.8-inch longer in length and 11-inches longer wheelbase than an Atlas SUV. It the longer and wider midsize pick-up truck in the segment offering functionality and power at the same time. Also read: 5 Best Concept Cars of All Time! The VW Atlas Tanoak Concept is built on an MQB modular platform allowing the brand to get most of its size. It has a short-bed design and a crew cab featuring 50.4-inches room between bed wheel wells. Also, it offers a 64.1-inch carbo bed extendable to 90.2-inches once it is opened fully. It has the aesthetics and styling similar to an Atlas Cross Sport Concept. Also, it has an Illuminated VW logo amidst the extended headlights having an overall rugged appearance. The exterior is more accentuated to look impressive by bespoke wheel arch extension made from strong plastic. The VW Tanoak Concept has rail slides to carry the items and provide more functionality of every design details. It has a set on 20-inch high gloss wheels that are finished in aluminium to add more appeal to the future vehicles’ design. a perfect utility vehicle with greater functionality amalgamating good looks. It was animated taillights having consistency with front design. The red LED strips placed on upper and lower tailgate to create three-dimensional details which look stunning at the first sight. Being the latest entry in future vehicles, the Volkswagen did not stop to stun and impress the enthusiasts. The Atlas Cross Sport Concept has strong impression on the Tanoak Concept pickup truck and there is a reason behind it. The design details and technologies are easier to understand in this case and thus the styling cues are found similar in Tanoak Concept. It has illuminated bar running across the dashboard length making the interior ambient and attractive. 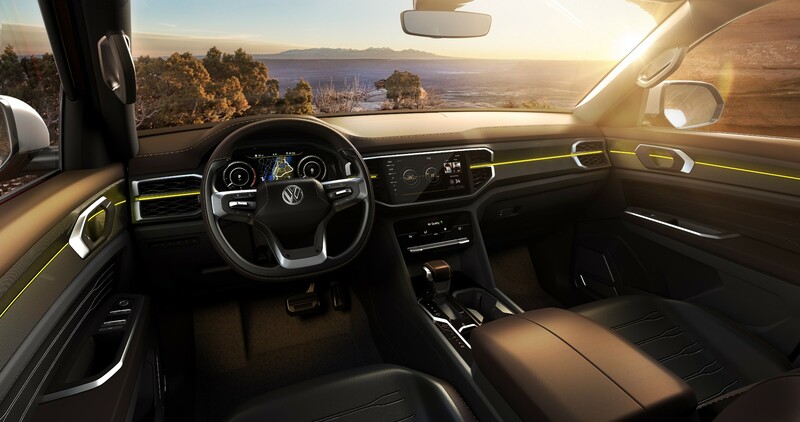 The designers at Volkswagen made the lighting effects emit yellow or blue light at night depending upon the in city or off-road driving modes. The center tunnel and console have an updated and advanced infotainment system which sits high up providing better accessibility to the operations. Volkswagen Atlas Tanoak Concept has a Digital Cockpit offering a futuristic digitalized environment not available in many production model pickup trucks. Being a bigger midsize pickup truck, it has plenty of space and has a capacity of 5 passengers. Future vehicles are supposed to have better performance than their predecessors. 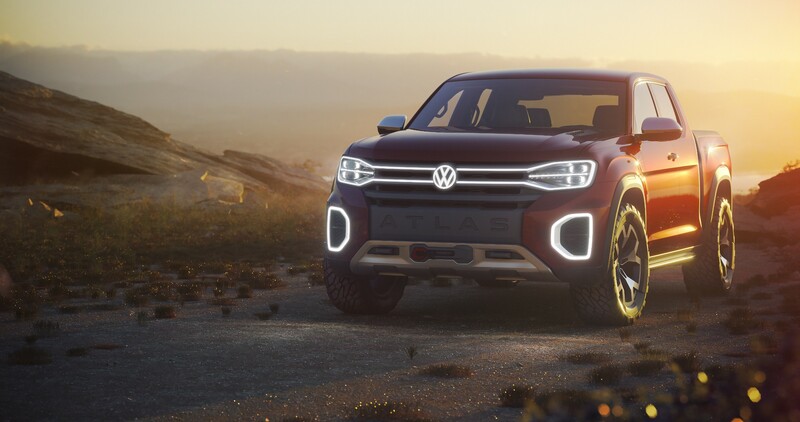 Thus, the VW Atlas Tanoak Concept fits best in this segment, having a 3.6-litre V6 engine capable of producing 276 horsepower and a 266 lb-ft. of torque. The power channels through an 8-speed automatic transmission, sending power to all four wheel by Volkswagen’s 4Motion all-wheel-drive system. It can go from 0 to 60 mph in 8.5 seconds. Though this is not a supercar like impressive performance, for future vehicles in pickup trucks category, this could do better. Furthermore, this pickup truck is not best for in city rides but also gives better performance in future vehicles segment on off-road terrains. This concept has the ability to make your off-road driving in a challenging condition safe and smooth. The ambient lights in cabin changing according to the drive modes add more grace to the style. Volkswagen wanted to build a pickup truck for the American market, and thus they made the Atlas Tanoak Concept greater functionally. The American pickup trucks are supposed to be big, muscular and powerful thus is so the Atlas Tanoak Concept. The engineers and designers and designer at the Volkswagen wanted to make something which is more American like and has never been built before. Having strong design lines, bold and muscular makes this pickup truck to have a stronger identity in the future vehicles segment. The truck is able to ride 9.8-inches of the ground and has both in city and off-road capabilities. Much specifications have not been revealed yet and it is still a show car now. VW amalgamates versatility and functionality at one place to give a stronger and functional pickup truck customers expecting from the brand. Until now it is a show car, but due to its hype and demand, there are high chances to see this vehicle on the production line, although there could be some chanced and fresh look on this new entry of future vehicles.